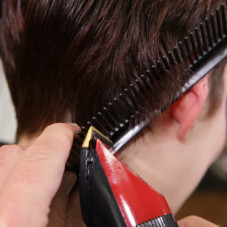 Patented LEDGE controls clipper blade as it passes across the comb, helping to eliminate lines of demarcation and improving clipper over comb blending. With its innovative design, THE LEDGE COMB is able to protect the ear and skin while using the clipper for over comb tapering. With its large cutting face, THE LEDGE COMB is easy to use for both left and right-handed stylists on all hair types and lengths. THE LEDGE COMB’s unique patented design erases the fear of clipper cutting, allowing stylists to feel more confident while creating precision clipper styles. You will immediately feel your confidence growing as the clipper blade balances on THE LEDGE, eliminating lines of demarcation, creating the perfect blend for all types of hair cuts, and all hair types. 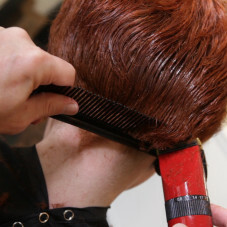 Made of HIGH QUALITY VIRGIN POLYPROPYLENE, the 8” long, and 2” wide LEDGE COMB will dramatically improve your end result. 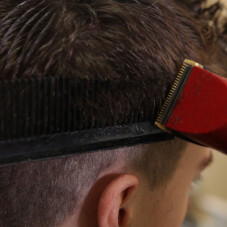 Your clipper will glide along it’s ¼” LEDGE, allowing for the perfect cut. THE LEDGE COMB’s exclusive design allows the clipper to be used in both directions, and can be used by both right and left handed stylists, to create magnificent styles, and protects your client’s ears and skin.